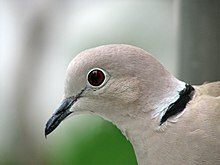 Collared doves (Eurasian collared dove, Streptopelia decaocto) are relatively small and slim doves. Males and females look alike, with a pastel buff/grey body with pink accents and slightly darker grey on their wings and tail. It is about 32 cm long. They nest near inhabited buildings for preference. This dove is hugely successful in the present-day world. It is one of the great colonisers of the bird world. It has travelled far beyond its original range to colonise colder countries. It is now a permanent resident in several of these northern countries. The species has also colonised much of North America. This page was last changed on 12 May 2018, at 17:05.